Traveling in Bangladesh last weekend, Secretary of State Hillary Clinton was confronted with a question she said "hurts me so much." Why, she was asked, is there "a common perception held by many young people that the U.S. is anti-Muslim?" "I mean, it's a painful perception to hear about, Clinton said, "and I deeply regret that anyone believes that or propagates it." There may be discrimination, but that cuts across racial, religious and ethnic lines, she said. American law and culture "has gone probably farther than anywhere else in the world in trying to guarantee legal protections for people." Claims that America is anti-Muslim come from people "who, for their own reasons, try to politicize what the United States has done in a way that I think is unfortunate and unfair," she said. In many cases, however, the message that America is hostile toward Muslims is promoted by the same people Clinton's State Department and other Cabinet-level agencies turn to as outreach partners. We've noted repeatedly how national Islamist groups like the Muslim Public Affairs Council (MPAC), the Council on American-Islamic Relations (CAIR), Muslim Advocates and others have pushed the notion that America's legal and military war on terror amounts to a war on Islam. It's an irresponsible message for two reasons. It is wrong. And it has been proven to be among the most effective messages in radicalizing young Muslims. Yet the same groups who perpetuate it in America find themselves embraced by the government. Officials legitimize and empower them by attending and speaking at their events rather than building the profile of Muslim voices who tout the freedom and opportunity their families find here. Most recently, Cyrus McGoldrick, civil rights director for CAIR's New York chapter, told a newspaper that a spate of arson attacks by a lone suspect on mosques was driven by bigotry even though police say personal vendettas were in play. In one case, a mosque had refused to let the suspect use its restroom. "It was only a matter of time before the war abroad became a war at home," McGoldrick said. "Fearmongering about Islam and other American minorities have ripped this country apart. Warmongering politicians and willing media confirm this narrative, the warrantless incomprehensive surveillance of the Muslim community by the NYPD confirms this narrative and the destruction of the Constitution in the name of the war on terror confirms this narrative." McGoldrick was angered by disclosures of New York Police Department surveillance of public settings and its review of web pages as part of its efforts to identify pockets of radicalization among the local Muslim community. His organization joined 15 other groups, including the Muslim American Society and Islamic Circle of North America in sponsoring a rally against "NYPD and CIA Repression" last November. During that event, Shahina Parveen Siraj, whose son Shahwar Matin Siraj was convicted of plotting to bomb New York's Herald Square subway station, said, "In addition to the wars abroad, there are wars here against Muslims, African Americans, immigrants and the poor." Siraj's claim of entrapment was rejected on appeal. Shahina Siraj's claims were echoed by DePaul University Professor Laith Saud, a frequent host of CAIR-Chicago events. "But neo-cons and neo-liberals are more interested in promoting war against the entire Muslim world and our own interests for inexplicable reasons," Saud said. The State Department has sent CAIR officials abroad on goodwill missions, including at least two by Michigan director Dawud Walid. During a 2010 trip to Mali, Walid depicted American law enforcement as inherently hostile toward Muslims. "Since the tragedy of September 11, 2001 American Muslims have been subjected to increased discrimination from racial and religious profiling by law enforcement." CAIR officials have no problem routinely appearing on Press TV, Iran's state-controlled English-language outlet, to criticize American treatment of Muslims. But CAIR is far from alone in fueling an international perception of anti-Muslim bias that was raised by Clinton's questioner. Muslim Advocates, a group of attorneys, joined in sending a letter to Attorney General Eric Holder accusing the NYPD of trampling the civil rights of Muslims and other minorities. "As a result," it said, "Muslims are being sent the message that the government officials entrusted with protecting their rights will not do so, and furthermore, these officials will not investigate allegations of police misconduct." Muslim Advocates Executive Director Farhana Khera has visited the White House several times in the past two years and been influential in pushing government officials to purge training material about Islam that the group didn't like. She has been less effective arguing against FBI counter-terrorism sting operations that she dismisses as forms of entrapment. Holder directly rebuffed the argument during a December 2010 speech at a Muslim Advocates event. "Those who characterize the FBI's activities in this case as 'entrapment' simply do not have their facts straight or do not have a full understanding of the law," Holder said. But one of the administration's chief advisers on Muslim issues also has pushed the idea that America has treated its Muslim citizens unfairly. Dalia Mogahed, a pollster by trade, said in 2009 that Islamophobia "presents a grave danger to America as a whole." A year earlier, she lamented a "witch-hunt" against Muslim groups in America. "There is a concerted effort to silence, you know, institution building among Muslims. And the way to do it is malign these groups" such as CAIR and the Islamic Society of North America (ISNA), she told a Religious Newswriters Association conference in Washington. CAIR and ISNA were maligned, but by their officials' actions, evidenced in exhibits in a federal terror-financing prosecution, and not by politicians or pundits. Those exhibits showed ISNA provided early service to a Hamas-support network in the United States and that CAIR is the progeny of that Muslim Brotherhood-directed effort. For all the noise, Clinton's response that America "has gone probably farther than anywhere else in the world" in protecting religious liberty is supported by a few key figures. More than 900 new mosques have opened in the United States since 2000. The Muslim population is expected to double here by 2030, reaching 6.2 million people. Such signs of a robust and growing community don't mesh with national Islamist activists who depict Muslims as under siege. On the other hand, those groups routinely smear Muslim voices who proclaim loudest that America is the best place for a Muslim to practice his/her faith. If the Secretary of State truly is hurt by the perception, she might consider embracing those voices who trumpet American freedoms and challenging those administration allies who foment ill will. Ostracizing Islamist groups who, despite their embrace throughout the Obama administration as "allies" in the war against terrorism, is necessary to stop the perpetuation of hate against the United States. No matter what the Obama administration claims about its achievements in defeating terrorism, it is actually enabling of Islamic terrorism by embracing radical Islamist groups who issue the same hateful narrative against the United States that Secretary Clinton has decried overseas as "painful." To quote Pogo, we have met the enemy and he is us. 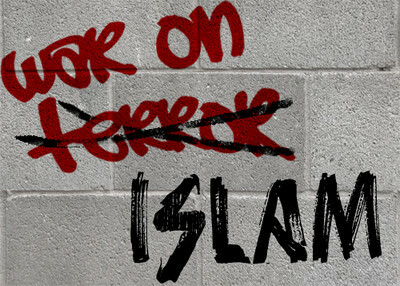 cair is lying in its representation that the united states IS at war with islam. cair is confusing the way it IS with the way it SHOULD BE. islam has been at war with the united states since our nation was founded, even though we are too clueless to war back. what cair is accidentally telling us is what is so obvious to them: that the united states, and any other reasonable country that wishes to survive, SHOULD BE at war with islam. the free countries of the world SHOULD expel all their muslims, and SHOULD massively retaliate any further provocation received at the hands of that evil religion. that is what cair is telling us. will we listen? What is wrong with fighting Ideas with Ideas? Ideas have to be defeated by better Ideas, and not with weapons! What is WRONG with this approach? After WWII ended, the USA (and others) had absolutely NO problem with fighting against the *IDEOLOGY* which fueled the *third Reich* Nazism. This *fight* is still ongoing, today we have laws in place against the *revival* called *Wiederbetätigung* of Nazism! What drives the "terrorists" in EACH and every case it is some *ideology* or system of thought! The Idea to act upon is first, then follow the actions! Only a lunatic would do something stupid, without being able to explain WHY or for what reasons he did it. With Muslims it is their "religion", way of life. When Sharia stipulates that *Democracy* is from humans, and not from a deity, Muslims will NOT implement it, they might jump on the Bandwagon for a time-being, but given the first chance and to establish their Islamic social system, they will do so. All the while one can still separate Muslims from their "religion" because not all Muslims will or are able to carry some of the calls to violence. Ahmed you display so much rage and hate. You need to relax. I sure hope you don't live in America, that would make you a hypocrite. Many of our people are brain washed and dellusional, don't add to the problem. Steve Emerson! why have you confined your attack to Muslims and Muslim Organisations of the United States. These people and organisations must be a thorn in the sides of people like you, but in a much drummed-up American 'Democracy' they have ever right to exercise their views. Ask your Native Americans and the African Americans why hatred for America is both global and legendary, a reputation well deserved. People of the world are not blind to the crimes of America, therefore, support for Hamas and Hezbollah should not come as such a surprise to you. Besides, who gives a damn if America brands them as 'terrorists', the fact of the matter is that Hamas got elected and Hezbollah defeated Israel. Finally, to help you out of your long cultivated delusion, your Superpower America with all the money and arms could not defeat the rag-tag Taliban; even with the help of 45 other Countries. So Stick that in Your Pipe and Smoke it!